Paperback, 8 x 10 in. / 80 pgs / 23 color / 48 bw. Edited by Caroline A. Jones. Text by Edward F. Fry, Caroline A. Jones, Hans Haacke. 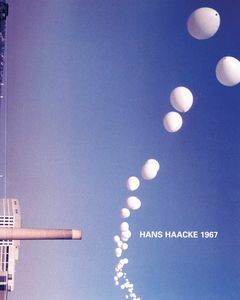 Hans Haacke 1967 documents the recreation in 2011 at the MIT List Visual Arts Center of a Haacke solo show held at MIT in 1967. Archival photographs from the original installations are included in the catalogue, as is the introductory essay to Haacke’s famously cancelled solo exhibition planned for the Guggenheim in 1971. FORMAT: Pbk, 8 x 10 in. / 80 pgs / 23 color / 48 b&w.